(Also known as Lilium kelleyanum var. shastense) This is another of our favorite species and memories of the first time we viewed Lilium shastense in the early 1980's will always remain with us. The bog in which these photographs were shot was located within the city limits of the town of Mt. Shasta alongside a railroad yard. Though protected by California law, this bog was filled in by the railroad with rock. As with Lilium maritimum, in the name of progress, permits could be had to destroy these natural wonders, but none were available to move and save the same plants. 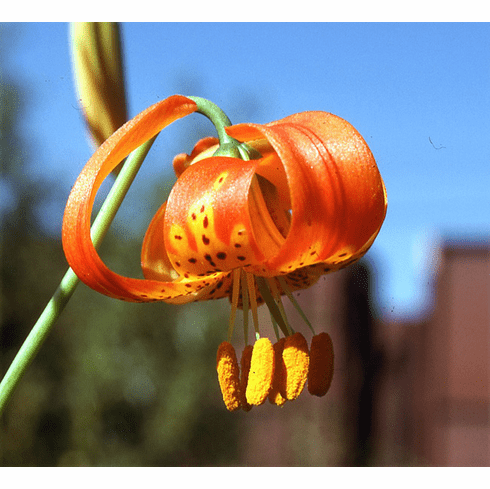 The lightly fragrant, Turk's Cap flowers of Lilium shastense are orange-red in color with black spotted golden-yellow centers. Growing in nature to over 8 feet, this is a difficult garden subject requiring a muck-peat soil that is moist nearly year around. A soaker hose left to a slow drip works well with this lily. Title photo inset #2 are close ups of two of the flowers found in the Mt. Shasta colony. Inset #1 is Dianna Gibson who is 5 feet, 5 inches in height. Though she is slowly sinking into the bog in this photo, this image showed the "average" height for this now-lost colony.